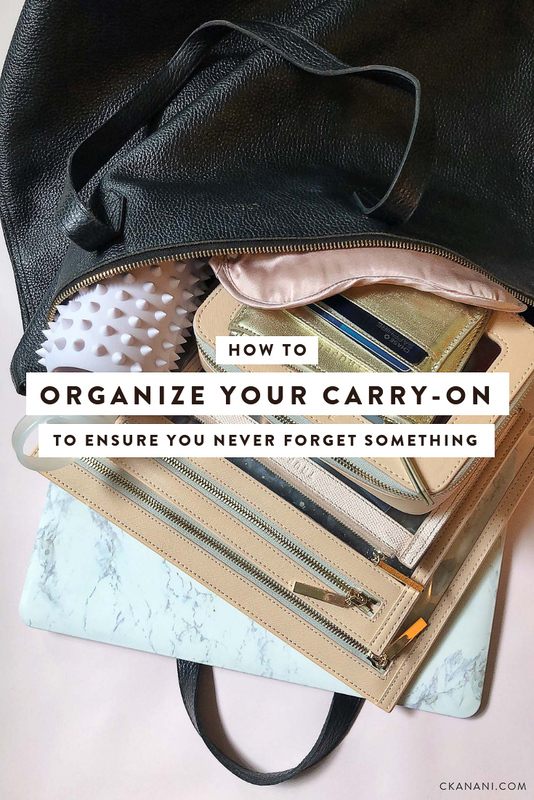 When you’re done reading this, click here for the ultimate carry-on packing guide for all the items to include! I never, ever, ever travel without my Cuyana Leather Zipper Tote. I’m also a proud owner of the Classic Leather Tote, my first Cuyana purchase, but for travel I think it’s important to have a zipper which is why this one is my ride or die. As I mentioned in my Best Travel Bags and Luggage For Women post, prior to this purchase I religiously used my Louis Vuitton Neverfull Tote and swore by it (it can hold over 500 lbs or something crazy). But, to my surprise, the exact same items in my Cuyana tote felt so much lighter, and thus a new love affair was born. And that is saying a lot considering the Louis Vuitton costs 5X as much! I can also attest to the quality of this bag. There are plenty of similar ones by other brands that don’t hold up well and are not made of such quality materials. I have personally been using my Cuyana Classic Leather Zipper Tote almost everyday for at least five years and it is still in great shape, as you can see in the photo I shot below. A structured organizational insert to make finding items in the bag much easier! I try to keep my life as organized as possible and I’ve noticed that when I use an actual wallet I just start to accumulate more and more things I do not need. To save space and keep things simple, I use this Truffle Privacy Leather Card Case to hold all of my cards (debit, credit, driver’s license, etc.). Along the same lines as above, I use this coin pouch to store all of my cash and coins while on the road. It saves a ton of space compared to a traditional wallet and I’ve started to really like having the two separated. I use Truffle’s mini clarity clutch to hold my passport and boarding pass and cannot imagine ever using anything else. A traditional passport case doesn’t do a good job of keeping your boarding pass and luggage receipt actually with your passport, unlike this clutch! It’s easy to quickly pull out of my bag and the fact that it has it’s own distinct home means I always know exactly where it is. Highly recommend! Note: I think it is extremely important to store only your passport, boarding pass, and luggage receipt (if you have one) in this. Keep everything else separate. 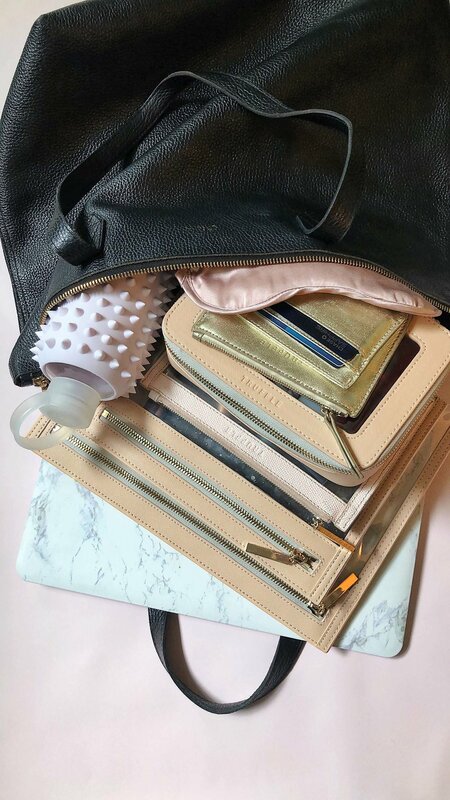 Truffle’s Large Clarity Clutch is where I store all of my paper goods; notebooks, my planner, printed itineraries, contracts for whichever campaign I am on, tickets for things post-flight, a pen, etc. I prefer to keep these things in this clutch instead of on their own floating the bag because then they are protected from water and other liquids. I also randomly keep my silk eye mask in here too so that it is protected from liquids, too. For any skincare, cosmetics, or liquid products, I use the Truffle Clarity Jetset Cosmetics Case. This includes things like face masks, hand lotion, facial spray, hand sanitizer — anything beauty-related that I need to be able access during my flight. There’s now a jumbo-sized version for those of you that need more space for cosmetics! Click here for that. For everything else, I use the Truffle Small Clarity Clutch! This includes things like chapstick, lipstick, lipgloss, Advil (regular and also PM), travel perfume, lavender oil (to sleep), my favorite hand cream, etc. To store jewelry safely and avoid any breaking or tangling, I love Cuyana’s leather jewelry case. It’s not too small that nothing will fit but also not too big that it takes up too much space. Perfect for traveling!